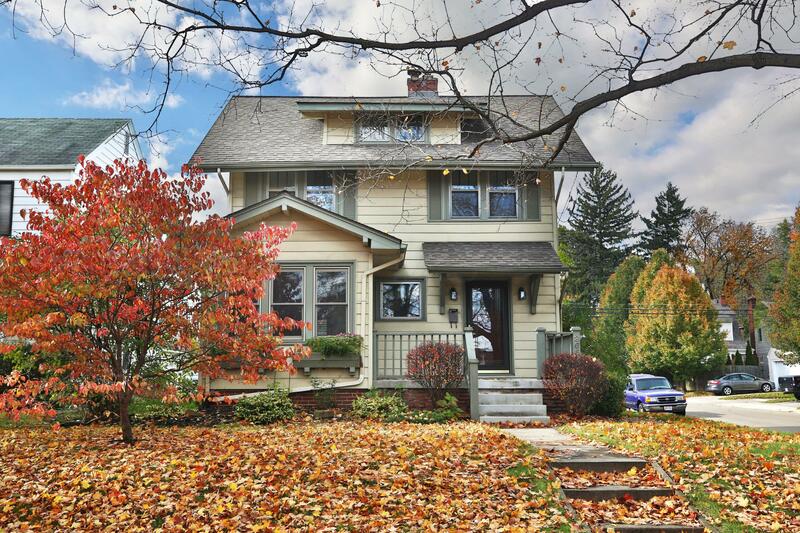 Charming Four Square home on one of Bexley's most popular streets. 2 short blocks from Main St. Desirable front porch. Whimsical ceramic fireplace w/ carved wood mantle greets you as you enter the large living room & adjacent sunny office/den. Beautiful, deep woodwork, french doors, hardwood floors throughout. Updated chef's kitchen; SS appliances, gas range, long granite counters, plentiful cabinets, angled stainless sink, counter seating, coffee bar, pantry. Opens to wood deck, private fenced yard & 2+ car garage. 3 bedrooms + bonus ''Seuss room'' on 2nd floor. Playroom/library/storage on 3rd floor, 4th Bedroom & full bath in partially finished LL. Separate Basement walk out. Original & replacement wood windows. Priced to sell & make your own. Short walk to Montrose Elementary School.